A world where one young woman dares to take a stand. "This blistering new adaptation sees Sophocles' tragedy reimagined in a dystopian landscape, where fate is written in code and where drones flock across the skies. 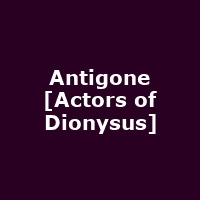 Brought to life by innovative theatre company Actors of Dionysus, this production combines bold ideas with passionate and visceral physical theatre."